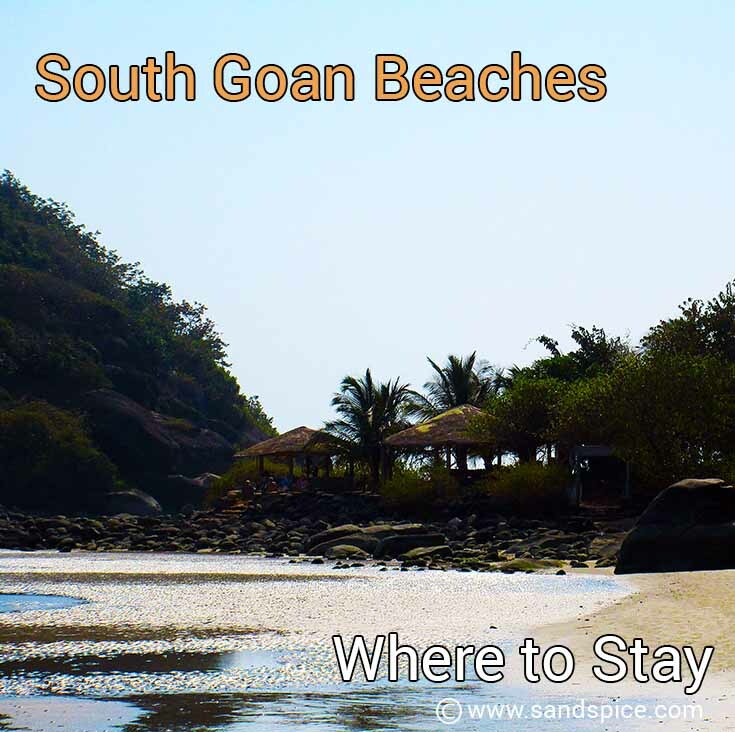 When we arrived in Goa, fresh off the night train from Kochi, we hadn’t yet decided between the South Goa Beaches – Agonda beach or Palolem beach. We had nothing booked, so left it to chance. 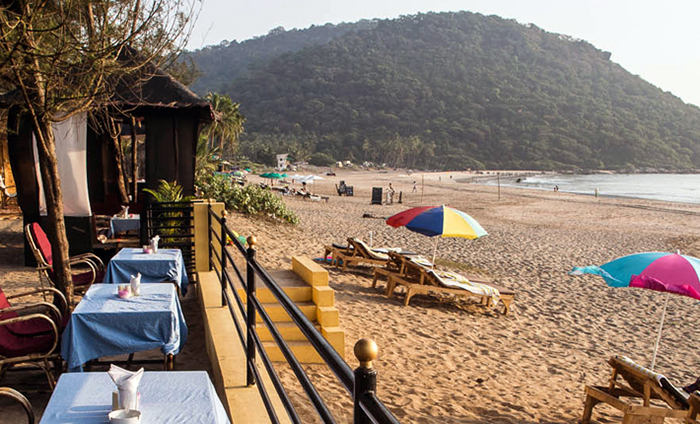 As it turned out, our first experiences would be on Palolem beach. After an hours march from the station we were happy to dump our backpacks and grab a couple of beers. After that, it was back to business and the (semi-) serious task of choosing our next guesthouse. They say you have to kiss a few frogs before you find your prince(-ess), and we certainly had to pucker-up for the next hour or so. Eventually, we settled on the Abel Cressinda. It seemed a bit basic, but would do for 1 night whilst we got our bearings. We paid 800 rupees for one of several cabins located in a pleasant garden setting behind the resort. You can find out more about this place here. 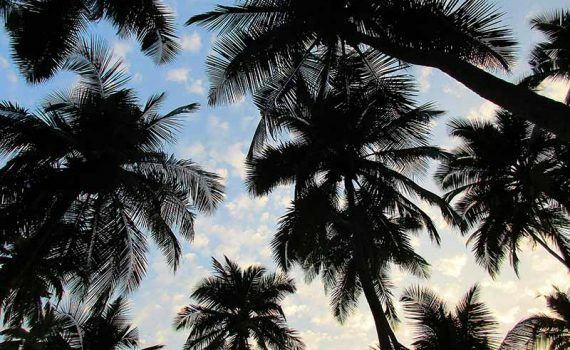 For now, we were still taking in our first impressions of what Goa had to offer. Arriving from Kerala in the South, to us the most striking thing about Palolem beach, and all the other beaches we visited, was the calmness of the sea. You can actually swim here without being constantly knocked over or swamped by giant waves. The sand is white and fine, not black or coarse. There is a very easy, relaxed feeling about these beaches, enhanced by the ubiquitous but gentle reggae and buddha bar music. There are no patrolling hawkers here constantly trying to sell you their wares on the beach. Of course, the small shopkeepers will call you over, but if you choose a spot to sit down you won’t be hassled by anyone. Finally, alcoholic drinks are available everywhere, and are much cheaper than in Kerala: 100 rupees for a large 650 ml Premium bottle of Kingfisher beer. Considerably cheaper than the 180 to 210 rupees we were paying in Kerala. You can also buy chilled booze to drink at home from a couple of shops behind the beach. A large 650ml bottle of Kingfisher Premium beer cost 60 rupees at one of these shops. A cheap 750ml bottle of gin costs 190 rupees. 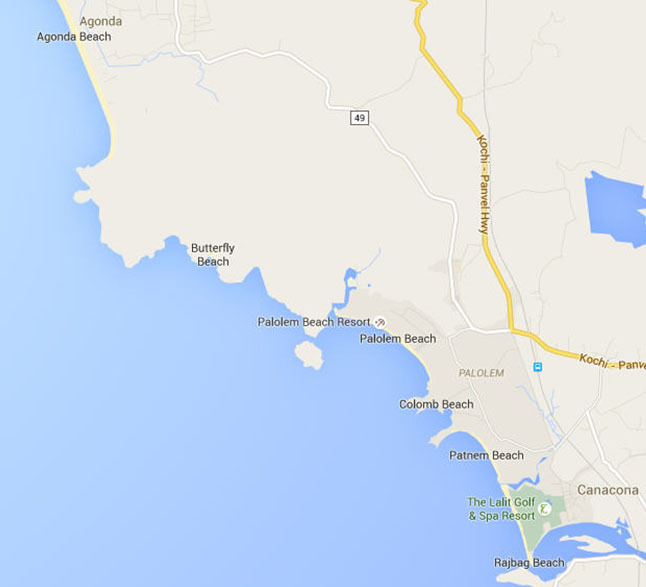 A few kms north of Palolem beach is Agonda beach. Actually, to travel between the 2 beaches by road, it’s more like 10 to 15 km. We know this because we walked it. 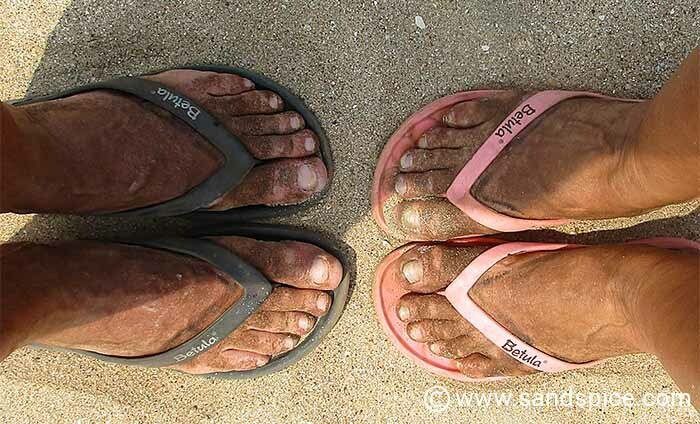 After finding accommodation for our first night in Palolem beach, we were curious to check out the guesthouse in Agonda beach that we had booked online 2 months previously. Our guesthouse reservation in Agonda wasn’t until the following week, but we wanted to take a peep at what was in store – lucky we did. 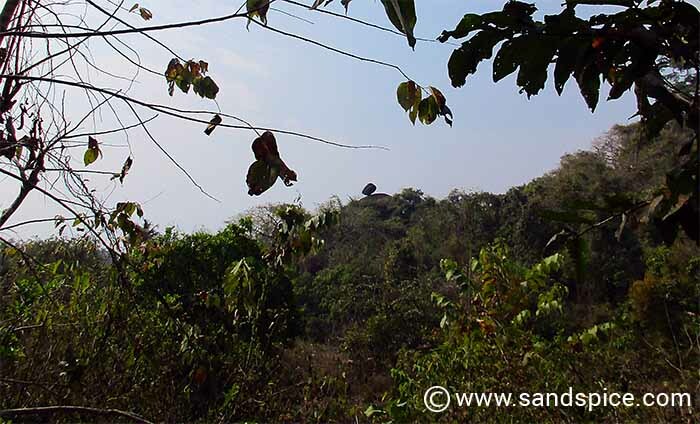 Our first attempt to reach Agonda was by taking the direct route from Palolem beach – on foot up the mountain and through the ever thickening jungle. We walked for a couple of hours as the small road crossed a bridge, then turned into a trail. As we started to head steeper uphill, the trail gradually dwindled to a barely recognizable gap in the mounting foilage, and the red ants and insects got to work on our overheated bodies. I wouldn’t recommend this (especially in flip-flops!). Had we persisted (…or had the right gear), we may have got lucky and found a way through to Agonda. Better than that, we may even have found a way through – by land – to the famous but elusive Butterfly beach. Normally, the only way to reach Butterfly beach is by boat from Palolem beach, since the hills behind are full of dense vegetation. There is no access by road. In any event, we had to give up on our mountain trek. We resigned ourselves to turning back and taking the less-interesting and longer inland coast road. At first sight, Agonda beach didn’t seem too different from Palolem. There was a handy ATM machine on the back street and the usual shops and eateries. A closer look at the prices for restaurants and guesthouses indicated it was a little more expensive than Palolem, and it seemed to be a little less busy. We found our guesthouse at the far north of the beach, hidden away behind trees and fences. This was the Secret Garden Guest House, and they weren’t kidding when they thought up the name. We had booked a Coco-Hut for 4 nights (€68). This comes to over 1,200 rupees per night. The Coco huts looked basic but adequate. When we found the owner, we explained that we had a 4-night booking in one of the huts for the following week. He told us he was surprised, since he had been taking no new bookings for the past 4 weeks. We explained we had made our booking 6 weeks earlier (…you can already see where this is going). He eventually offered to put us up in another location just off the beach. We got in his car, and he drove us to an inferior establishment, which we refused. To be honest, we weren’t too disappointed about this. In the couple of hours we were there, Agonda beach didn’t impress us in the same way as Palolem. We like quiet, but for us Agonda was just a little bit too sleepy, with fewer options for eating, drinking and entertainment – and higher prices. Later, we were able to reclaim the costs for our booking from the online agent. In the meantime, we returned to Palolem beach (this time by rickshaw 🙂 ) and resumed our search for a relaxing place to stay for the next few nights. At the time, we didn’t realize we’d be sampling a wide variety of the accommodation that Palolem has to offer.